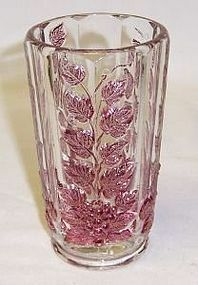 This really pretty Paneled Grape Ruby Flashed 4 1/4 Inch high Flat Juice Tumbler was made by Westmoreland Glass from 1940 to 1980. This Tumbler measures 2 1/4 inches across the top. It is in very good condition with no chips or cracks. The ruby flashing is all very good. It is signed WG on the bottom. This tumbler is hard to find. Be sure to search our other Westmoreland items available. We guarantee all items to be as described. Feel free to email with any questions. THANK YOU. 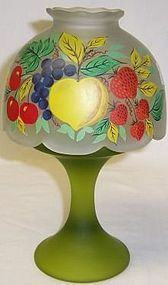 This really pretty Paneled Grape Ruby Flashed 3 3/4 inch high Sherbet was made by Westmoreland Glass from 1940 to 1982. This Sherbet measures 3 1/8 inches in diameter at the top. It is in very good condition with no chips or cracks. The ruby flashing is all very good. Be sure to search our other Westmoreland items available. We guarantee all items to be as described. Feel free to email with any questions. THANK YOU. 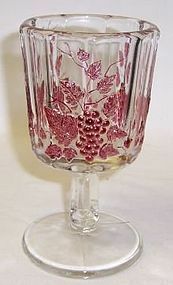 This really pretty Paneled Grape Ruby Flashed 5 3/4 Inch high Water Goblet was made by Westmoreland Glass from 1940 to 1982. This Goblet measures 3 Inches in diameter at the top. It is in very good condition with no chips or cracks. The ruby flashing is all very good. Be sure to search our other Westmoreland items available. We guarantee all items to be as described. Feel free to email with any questions. THANK YOU. 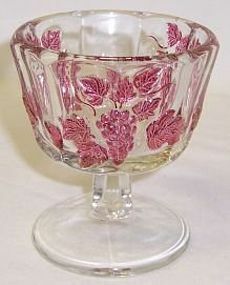 This really pretty Ruby Flashed Wakefield Waterford 4 inch high Sherbet was made by Westmoreland Glass. This Sherbet measures 3 inches in diameter and is in very good condition with no chips, cracks or cloudiness. The Ruby Flashing is good. Be sure to search our other Westmoreland available. We guarantee all items to be as described. Feel free to email any questions. THANK YOU. 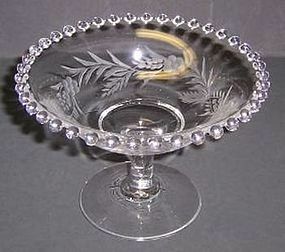 This pretty crystal clear Candlewick 3 3/4 Inch high Etched Mint Comport was made by Imperial Glass. The Comport has a plain stem with no balls. It measures 5 1/2 Inches in diameter. It is in very good condition with no chips, cracks or cloudiness. The glare in the picture is from the flash. Be sure to search our other Candlewick available. We guarantee all items to be as described. Feel free to email with any questions. THANK YOU. 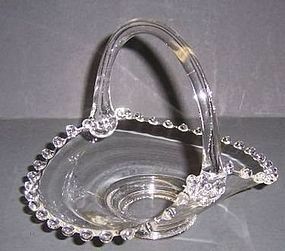 This really pretty crystal clear Candlewick Handled Basket was made by Imperial Glass. The Basket measures 6 1/2 inches wide X 5 1/4 inches across the bottom. It is in very good condition with no chips, cracks or cloudiness. The streak in the glass is from the flash. Be sure to search our other Candlewick available. We guarantee all items to be as described. Feel free to email with any questions. THANK YOU. This really pretty crystal Colony 3 Piece Mayonnaise Set was made by Fostoria Glass. This Mayonnaise Set consists of a 6 3/4 inch diameter under plate, a 3 1/4 inches high X 4 1/2 inches diameter footed bowl and a 5 1/2 inch long ladle. All three pieces are in excellent condition with no chips, cracks or scratches. Be sure to search our other Colony available. We guarantee all items to be as described. Feel free to email with any questions. THANK YOU. 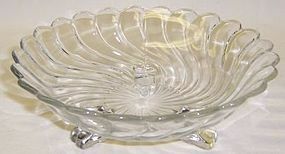 This pretty crystal clear Colony 3 Section Relish Dish was made by Fostoria Glass. This Relish measures 10 3/4 inches not including the handles and is in very good condition with no chips or cracks. The streak in the picture is from the flash. Be sure to search our other Fostoria glass available. We guarantee all items to be as described. Feel free to email with any questions. THANK YOU. 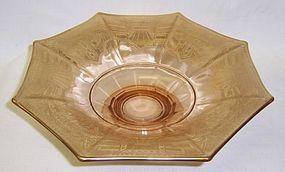 This really pretty amber, with Gold trim, 8 Sided, Footed Comport, was made by McKee Glass. The Comport measures 3 inches high X 9 3/4 inches in diameter across the top. It is in very good condition with no chips or cracks. The gold decoration all over the top is very good. We guarantee all items to be as described. Feel free to email any questions. THANK YOU. This pretty crystal clear Colony 3 Footed Bon Bon Dish was made by Fostoria Glass. This Bon Bon measures 6 1/2 inches in diameter X 2 1/4 inches high. It is in very good condition with no chips, cracks or scratches. Be sure to search our other Colony available. We guarantee all items to be as described. Feel free to email with any questions. THANK YOU. 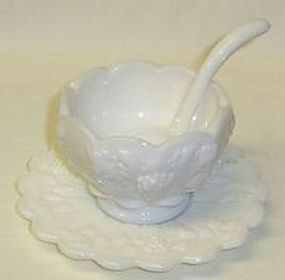 This is a really pretty milk glass Paneled Grape 3-Piece Mayonnaise Set made by Westmoreland Glass. This Set includes the saucer-style under plate, the mayonnaise bowl and the ladle. The under plate and the mayonnaise bowl are signed WG. The spoon is not signed. They are all in great condition with no chips or cracks. Be sure to search our other Westmoreland glass available. We guarantee all items to be as described. Feel free to email with any questions. THANK YOU. 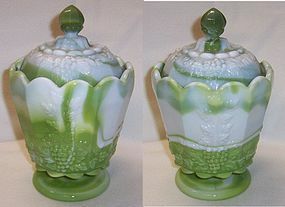 This is a really pretty milk glass Paneled Grape Colonial Candleholder made by Westmoreland Glass. This Handled Colonial Candleholder measures 5 Inches in diameter X 2 Inches high. It is in very good condition with no chips or cracks. It is signed WG on the bottom. Be sure to search our other Westmoreland glass available. We guarantee all items to be as described. Feel free to email with any questions. THANK YOU. 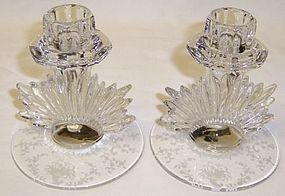 This pretty pair of crystal Mayflower Flame Candlesticks were made by Fostoria Glass. The Candlesticks each measure 4 1/4 inches high X 4 1/8 inches in diameter at the base. They are both in very good condition with no chips, cracks or scratches. Be sure to search our other Mayflower available. We guarantee all items to be as described. Feel free to email with any questions. THANK YOU. 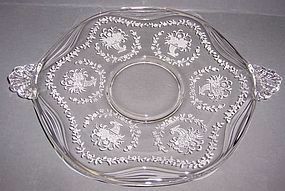 This pretty crystal clear Mayflower Handled Plate was made by Fostoria Glass. The Plate measures 10 inches without the handles, 12 1/2 inches including the handles. It is in very good condition with no chips, cracks or scratches. Be sure to search our other Mayflower available. We guarantee all items to be as described. Feel free to email with any questions. THANK YOU. 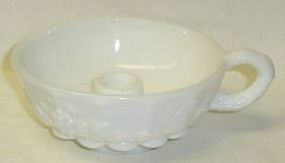 This is a really nice milk glass Colonial Candy Dish with Lid made by Westmoreland Glass featuring the hand painted Holly decoration. The Candy bottom and lid are in great condition with no chips or cracks. The hand-painted Holly decoration is all very good. It is signed on the bottom WG. Be sure to search our other Westmoreland glass available. We guarantee all items to be as described. Feel free to email with any questions. THANK YOU. This pretty Green Mist base with Crystal Mist top 7 1/2 inches high 2-Piece Candle Lite with Fruit decoration was made by Westmoreland Glass. This pretty Fairy Lite is in very good condition with no chips or cracks. The Fruit decoration is all very good. This Lite is signed WG. Be sure to search our other Westmoreland glass available. We guarantee all items to be as described. Feel free to email with any questions. THANK YOU. 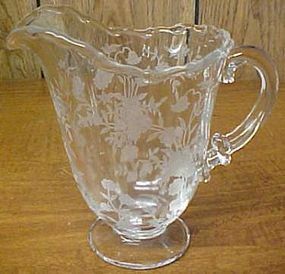 This pretty crystal clear Bouquet Milk Pitcher was made by Fostoria Glass. It measures 6 inches at the highest part and is in very good condition with no chips, cracks or cloudiness. We guarantee all items to be as described. Feel free to email with any questions. THANK YOU.